Lucid dreaming, or being able know you’re dreaming and possibly control the contents of that dream, is a real part of life that can also lend itself to the supernatural – especially in popular media. I can think of several films that rely on lucid dreaming as the narrative foundation; most of them are horror. For this reason, I did have a bit of trepidation about Radiant One (Free) – but one look at the screenshots, and my gut instinct said it could be something special. But was I right? I grew up with the innate ability for lucid dreaming, never realizing it was anything “special" until coming across it in something I read early in my teenage years. It began with repeated dreams, until I could recognize them as dreams and then be to recognize others as well. My experience with lucid dreaming is actually opposite to what brings Daniel to lucid dreaming in Radiant One. 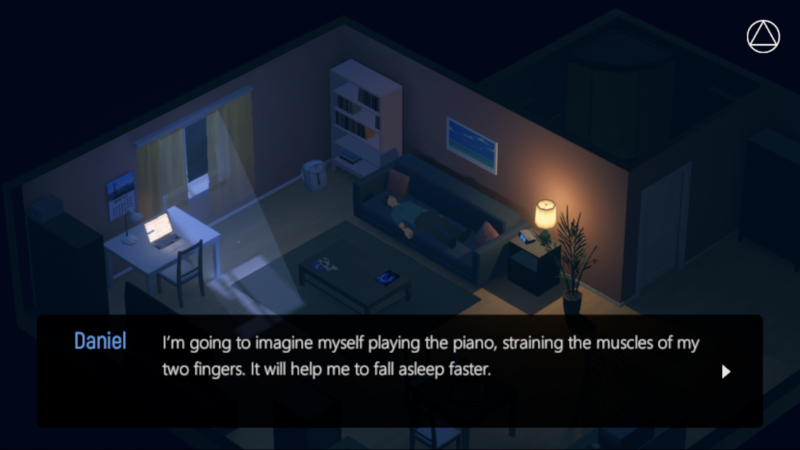 In the game, Daniel grows bored and restless with his own life, and picks up a book on the subject of lucid dreaming hoping that controlling his dreams will fulfill his emotional needs. Daniel struggles to learn lucid dreaming but once he does figure it out, he’s interested in little else. For example, he’s no longer interested in a video game that he initially anticipated playing; he’d rather just lay on the sofa and control his dreams. Why play something someone else made when you’ve got your own private video game in your mind? Unfortunately, when he goes past the point of no return, he’s forced to confront demons he never knew existed. It’s here that there is an echo of a familiar horror movie: A Nightmare on Elm Street. Its main characters, Nancy, learns the man with knives for fingers that lurks in her dreams is also in her friends’ dreams – except they started being murdered by him. Nancy specifically tries not to sleep, as being awake is the only place she feels safe. Nancy knows when she’s dreaming, which means she is lucid dreaming, but she tries to avoid it. Once Daniel feels unsafe, staying awake is also his solution. Luckily, this is where the narrative similarities end, proving my concerns false and immediately allowing me to fall into the game with ease and focus. Most of the game utilizes typical point-and click mechanics, with a few instances of swiping or tapping to a beat within a circle. Music and rhythm have a definite place in Radiant One, with a good set of headphones being an absolute must. Music brings you to the state of lucid dreaming. Music emphasizes the increasing threat as you approach a demon. Music is a link to your childhood. And the music – and sound effects – in the game are perfectly suited to each corresponding situation or environment. The environments are also worthy of praise. Dark places are sparsely yet dramatically lit. Each space, regardless of size (ranging from a small apartment to a large home), is filled with detail. Tiny books line the shelves of bookcases; magazines are left open on counters, with a layout clearly implied in the lines and shapes it contains; the video game David had been anticipating has its own cover graphic, with the silouette of a head surrounded by a turquoise light. Even David is remarkably detailed, as his back darkens with sweat from nightmares. The level of love and craftsmanship that has gone into Radiant One is absolutely breathtaking. Thematically, Radiant One revolves around lucid dreaming and its impact on one’s mental health. David wants to use it as an escape, but being able to essentially do what he wants overnight quickly turns from an escape to an unhealthy habit before setting on being a life-destroying obsession. This is actually not uncommon in people with depression to find an escape that turns into something negative; for example, many will turn to alcohol to help mute their thoughts. Lucid dreaming as David uses it is a crutch, not a tool or something fun. His days even become about his nights. He distances himself from work. 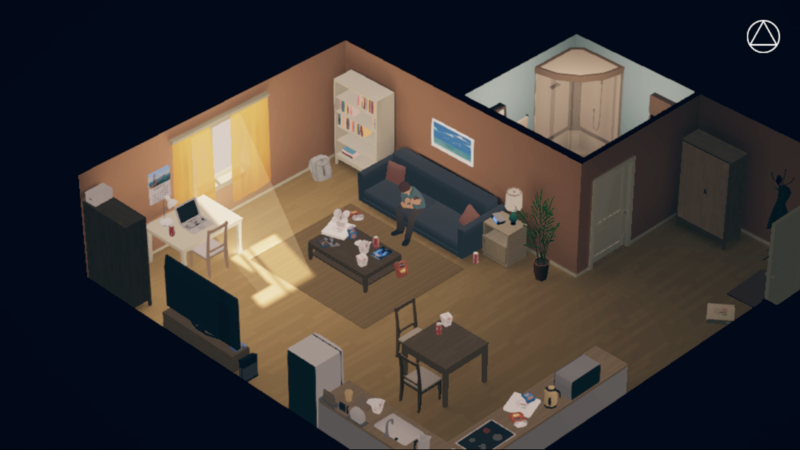 The way the game depicts escapism and depression is quite accurate, something I’m extremely pleased to see. While the experience is mostly narrative, there is this one moment that screams “mini-game" and seems almost out of place. It involves tapping extremely quickly for an undetermined amount of time, until you can no longer keep up with the speed required for the points to keep moving up. I feel it’s trying to reproduce the feeling of drowning under life’s stresses, and while it does accurately produce/reproduce stress, it also creates physical pain, not something expected in a point-and-click. There are absolutely supernatural elements past the demons in Radiant One, each used to enhance that feeling of stress and fear that builds up as the game proceeds. These elements are mostly phantom knocks and voices, but each serves a very specific person and these scare mechanisms are sparsely used throughout the game. Radiant One is not by any stretch of the imagination a long game: I clocked in around maybe an hour, and I like to pause for screencaps every few seconds so I progressed quite slowly. There is reason to play longer than the initial narrative run through, and that’s to discover all the bits of dialogue in the game that you may miss. While I do wish the game was longer in order the explore the themes more deeply, the short time is not at all a reflection on the quality of the title. So the question now becomes, was I correct to trust my instinct and know that Radiant One is worth picking up? Without a doubt. There are a few aspects of it I didn’t enjoy, mostly the mini game. I did also find myself craving more after the game ended, as the narrative is extremely interesting. However, reflecting back on my time playing Radiant One, it is the positive experience that remains in my mind. Being left wanting more isn’t necessarily a bad thing, after all; it means that I truly enjoyed and felt a connection to the themes of lucid dreaming, depression, and connection to others. The loving attention to detail in each setting did nothing but enhance the experience. I was absolutely right to trust my instinct, as Radiant One is a game not to be missed.